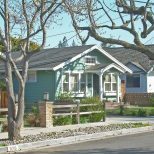 Her clients — a young couple in the cannabis industry with two kids — had recently moved to California from Colorado, where their previous home had been damaged by a fire. They had little in the way of furniture and accessories, so Elbaum was basically given a blank canvas to work with. 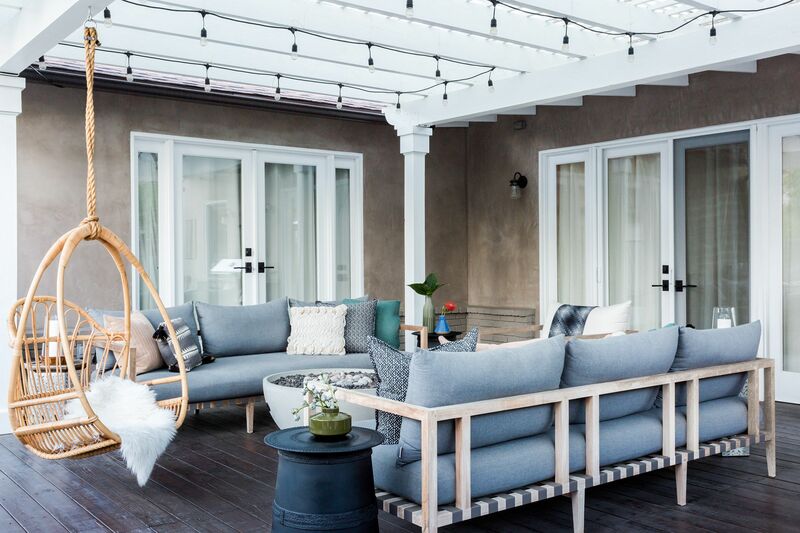 “They wanted a place that represented this California outdoor lifestyle that was casual and family-friendly,” explains Elbaum. The “entry-slash-formal living room” proved to be the biggest challenge of all. 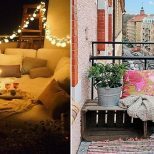 “A lot of these older homes have these little front rooms that are hard to work with because you don’t want to fill it with furniture, but it’s also too big to be just an entryway,” notes Elbaum. 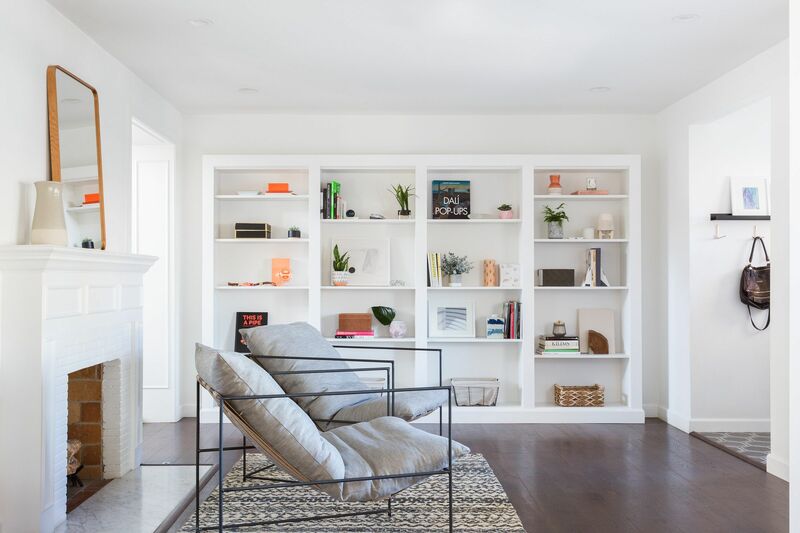 The designer chose to give the space a library feel, with two cushy lounge chairs and upgraded IKEA bookcases. 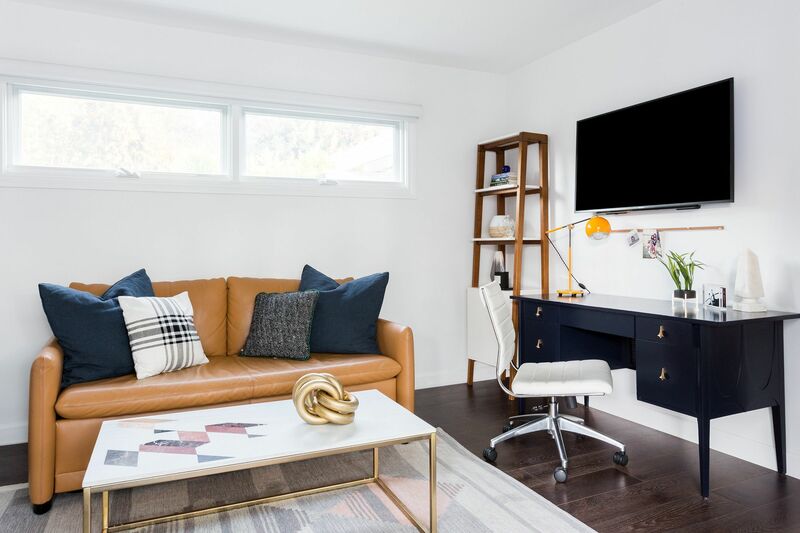 “We had a carpenter add trim to make them look more like built-ins,” says Elbaum. 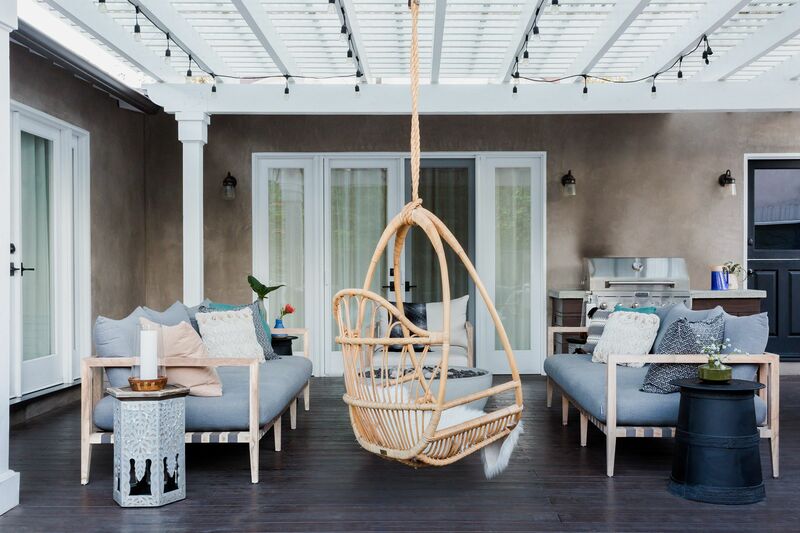 The aforementioned (and totally serene) outdoor space is located off the living area. 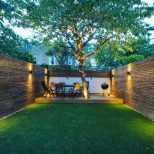 To make the transition as seamless as possible, Elbaum “built up the deck to be at the same level as the living room” and stained the wood to match. 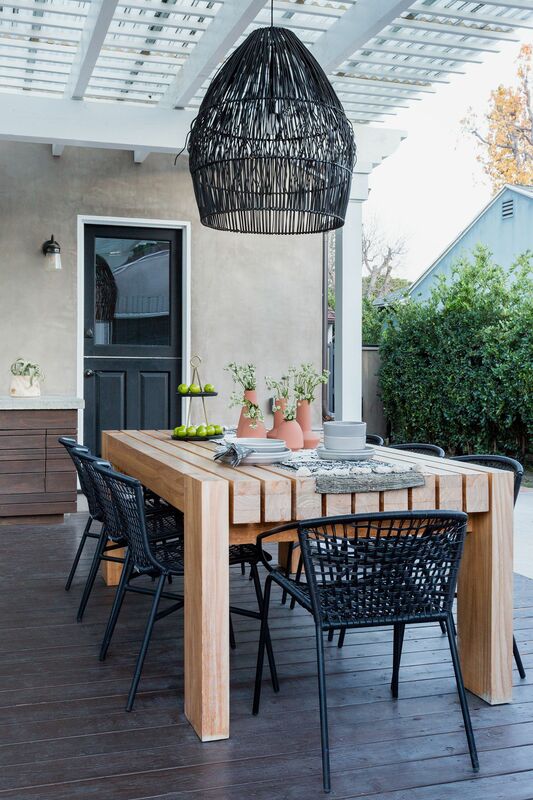 An eight-seater dining table is anchored by an oversized, woven bamboo pendant and two plush sofas flank a concrete fire pit sourced from Canada. 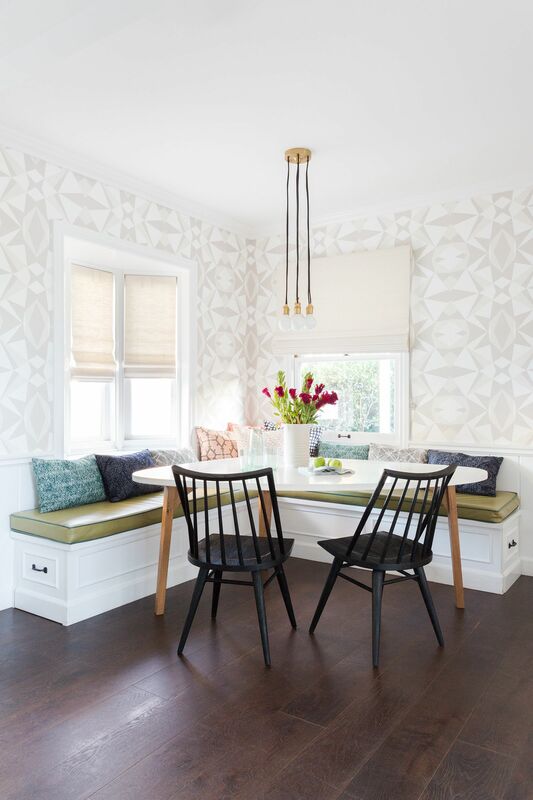 Back inside, Elbaum designed a banquette with ample seating, surrounded by striking geometric wallpaper. 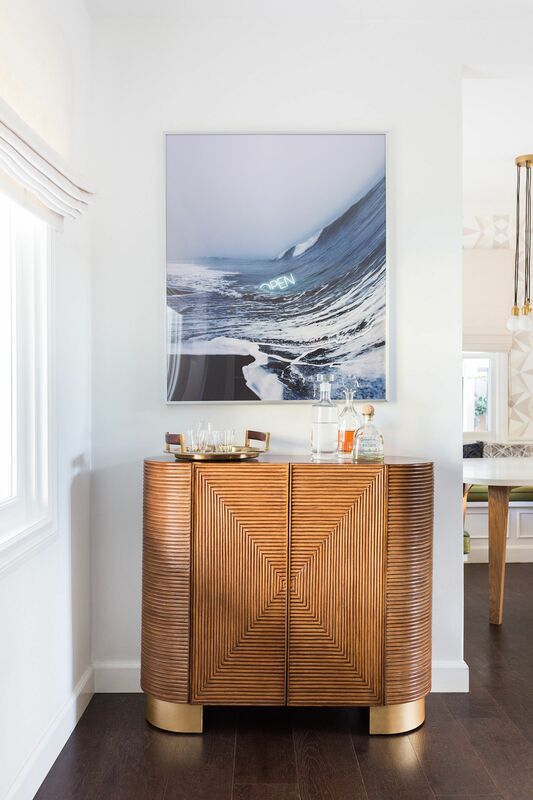 “There was a lot of white with the wainscotting and we wanted to break it up,” explains Elbaum. 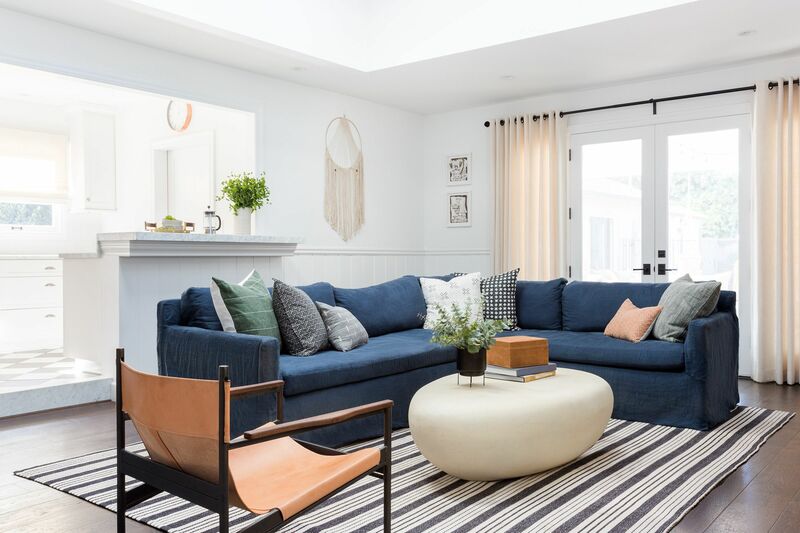 “We did a vinyl cushion cover for child-friendly purposes and all the pillows are covered in outdoor fabric.” She added pull-out drawers at either end of the bench for storing kids’ plates and placemats, and had the rounded triangle-shape table custom made to fit the space. While the project was underway, the clients’ family grew from three to four with the birth of a baby girl. 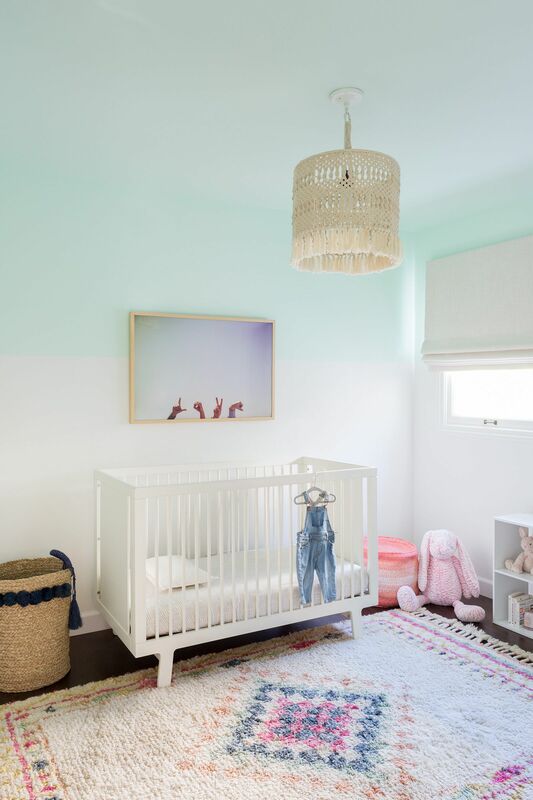 Their free spirited three-year-old was given the “big girl room” of her dreams with a rattan daybed and a statement-making light fixture from McGee & Co. “[The bedroom] has got a bohemian vibe, and she’s definitely got that kind of style — we based it off her personality,” says Elbaum. “The nursery we put together super quickly,” recalls Elbaum. Deciding against yet another pink bedroom, Elbaum and her clients settled on green. “It felt really fresh and we’d already done a good amount of wallpaper in the rest of the house, so we painted a third of the wall and the ceiling.” Elbaum threw down a textured, Morrocan-style rug, installed an affordable macrame drum pendant from World Market, and hung up an adorable print by photographer Max Wanger to complete the look. 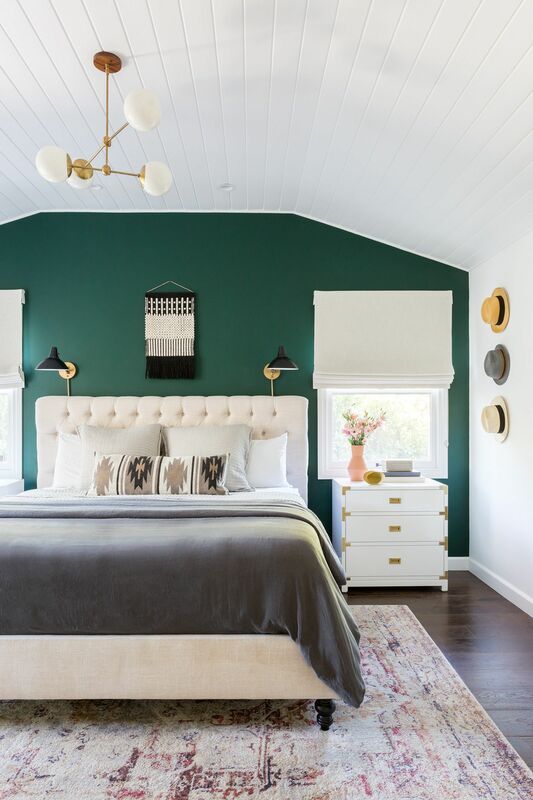 “When I walked into the master bedroom for the first time, I said, ‘You know, we should really paint this back wall.’ I suggested black and they were like, ‘Absolutely not!’” Once again, the trio agreed on green — this time a deep, forest hue. “It really just adds so much warmth to the space,” says Elbaum. There are brass accents scattered throughout and two, 36-inch night stands offer plenty of closed storage.